Family businesses epitomize the best of the American Dream, but all too often the family business becomes the family flop – destroying all finances and relationships in its path. Generational conflicts, torn loyalties, succession quandaries, differing opinions and personal spats prevent the success and happiness that should be achieved. 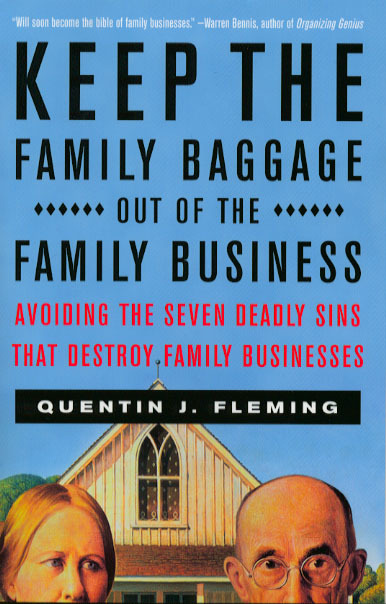 Family business expert Quentin Fleming breaks new ground by identifying the Seven Deadly Sins that are invariably responsible for a family business’s demise. By offering clear diagnoses and long-term solutions rather than Band-Aid fixes, the book’s strategies for success are practical, accessible and relevant to family enterprises of all shapes and sizes. No other book on this subject has achieved praise from such prominent experts. "Speaking from personal experience, such practical, humorous and insightful wisdom should be required reading for ambitious family businesses." "Will soon become the Bible of family businesses." "As a family patriarch with 60 years of experience running a family business, my reaction to Quentin Fleming’s wisdom herein is a hearty ‘amen’! Most of that wisdom I have slowly and often painfully acquired via the school of experience. If only I could have had it all when I started!" "This is a valuable book for anyone engaged in any aspect of a family firm. Both for the book’s insights and the thoughts inspired by the many valuable observations, this book will help all generations deal with the joys and sorrows of the family business." "As someone who has worked with many family members over the years, this book offers practical and valuable advice." "Quentin hit the nail on the head – a family business is a ‘business’ first. Apply good business principles first; if the family part works out, that’s a bonus." President and CEO, Ritz Camera Centers, Inc.
"Having a family-owned business can be more challenging than driving at 200 mph. This book is a roadmap that helps businesses win the race." President and CEO, Sports VIP’s Inc.
"What do you do when the ‘problem person’ at work is also your family member? This book provides the answers to that and many other questions, and should be required reading for anyone involved in a family business." Nationally syndicated workplace advice columnist. "Insightful, must reading for anyone actively involved in a family business." "Keep the Family Baggage Out of the Family Business must be read by every parent and every sibling in every family business." The contents on this website are Copyright 1997-2000 by Quentin J. Fleming. All rights reserved.